Our mission is to effectively respond to any emergency impacting public health through preparation, collaboration, education and rapid intervention. 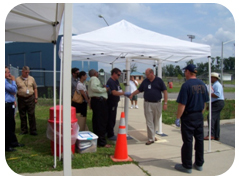 The Emergency Preparedness and Response Programs involve state, regional and local emergency response partners working together to enhance readiness to respond to bioterrorism, infectious disease outbreaks and other public health emergencies. Funding to support these efforts is provided through grants from the U.S. Centers for Disease Control and Prevention, U.S. Health Resources Services Administration and the U.S. Department of Homeland Security.